In large bowl, stir cookie mix, butter, egg and cream cheese until soft dough forms. Spread dough evenly in bottom of pan. Bake 13 to 15 minutes or until light golden brown. Cool completely on cooling rack, about 1 hour. In medium bowl, beat whipped topping and frosting with spoon until well blended. Spread over top of bar. 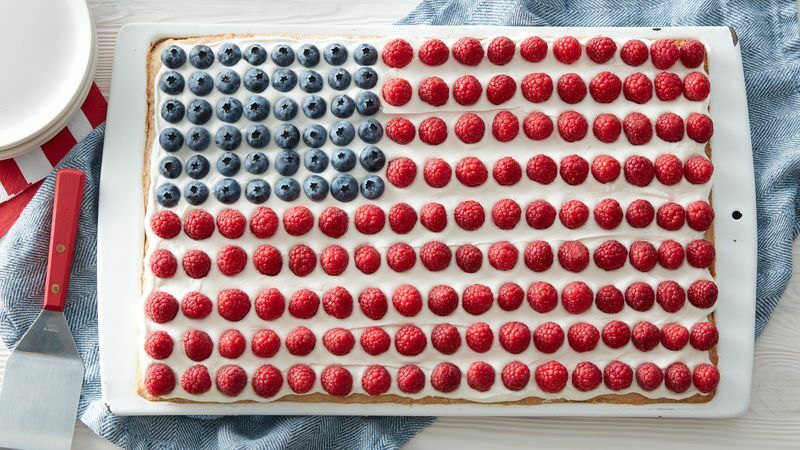 Arrange blueberries and raspberries on top of cake to look like flag. Store loosely covered in refrigerator. Try fresh strawberries instead of raspberries for the flag’s stripes for a new look!